This line, shared between two minor characters who have no import and yet for some reason share entire scenes together in this premiere episode, pretty much sums up True Blood these days. This is a show so stuck in a quagmire of nonsense that it introduced a ridiculous six-month time jump in last season’s finale to get out of the nonsense—and yet when the show picks up here, it becomes instantly clear it is still stuck in a quagmire of nonsense, just six months later. Welcome to True Blood’s final season, where at least the nonsense has a short shelf life! The Hep V-infected vampire epidemic is obviously going to be the big story driver for this final season, and it does have a bit of promise as a setup: Because TruBlood is now undrinkable and much of the human population is infected, Sam (who is the mayor now, which is still silly) has implemented a “one human/one vampire” policy, which both helps protect humans from the roving bands of infected vampires and gives vampires a clean food source in return. It’s a blessing and a curse in this premiere, giving the show some interesting pairings to play with—Jessica/Adylin and James/Lafayette being the most compelling—but at the same time taking the cast and essentially stranding them on their own little story islands, impeding their ability to interact with each other. Here’s the thing about the Hep V-infected vampires, though: They make no sense. Didn’t the show establish with Nora that the Hep V weakens the vamps? If they’re so weak, how are their packs of them able to kidnap Arlene, Holly, and Nicole while there were plenty of other non-infected vamps around the party who could have defeated them? And would a pack of vamps who were near death really want to kidnap people to save them for later? Logic be damned, though, because Arlene, Holly, and Nicole have been captured in order to give Sam a storyline as he attempts to rescue his partner and their unborn child. Really, though, despite the fact that most of this hour feels like a boring, plot-driven slog, the biggest problem with the whole thing is Sookie. This isn’t a new phenomenon for the show—Sookie has long been a troublesome central character—but it’s almost incredible that True Blood is going into season seven and still hasn’t figured out a way to evolve her into a strong center for the show. It’s season seven and Sookie is still somehow a confused pariah, and everyone in town’s thoughts are somehow constantly of how all of this vampire evil that surrounds them is her fault. It affects her relationship with Alcide, but it’s impossible to care because they got together in a six-month time jump and we have no investment in them being together. But perhaps the weirdest, most textual example of the show’s Sookie confusion happens at the end of the episode, when she delivers an “inspirational” speech to a crowd of churchgoers whose thoughts of her being a whore are constantly streaming into her head. It’s one of the strangest things the show has ever done, with Sookie delivering a tearful, questioning, buck up little camper-style speech, ostensibly addressing herself, in front of the entire town. It appears to be a personal call-to-arms, begging them to let her help solve the problem, but it’s unclear whose benefit that speech is for, exactly. Is it for the audience, to let us know Sookie is ready to fight? Or is it for the town, to shame them for judging her so harshly? And then it just… ends, with the episode cutting to black on Sookie’s confused plea. Whether it’s a plea to her fellow townspeople or a plea to herself, ending the season premiere in the midst of confused weakness is certainly a strange choice. 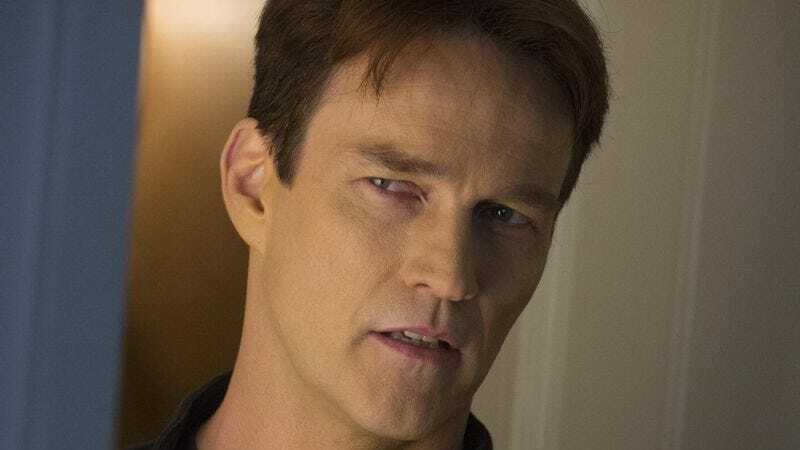 But if there’s one thing you can be sure of with True Blood, it’s that there will be much stranger choices to come in this final season. James, formerly played by Luke Grimes, is now being played by Nathan Parsons (Bunheads, The Originals). It took me at least halfway through this premiere to realize he wasn’t playing an entirely new character. Pam is in Morocco, stranded in her own storyline searching for Eric. It is a ridiculous distraction from the action happening back in Bon Temps, but at least it feels character-driven, and snarky Pam is never a bad thing. Is Tara really dead? We didn’t really see it happen, so I say no way. But the most important question: Will James and Lafayette make out?